Retail $11.50 SAVE 20% ! 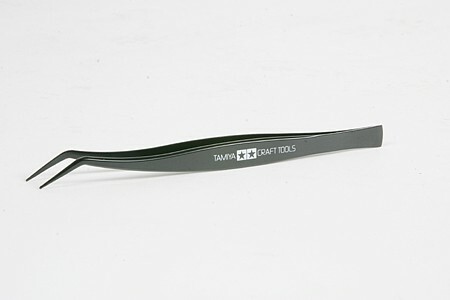 "Handy to have tool for building models"
I love these Tamiya Tweezers. When I got them I was surprised at the size. They appeared smaller in the photo, but these are just the right size for me. I have big hands and handling some of the smaller parts is very difficult, but with these tweezers small parts are much easier to fit. These tweezers are also good for decal work. "First Tamiya Tool Ever Owned"
Well worth the money spent. Tweezer has a little more weight to it than your standard department store tweezer w/ a great looking satin enameled finish. Also is a little wider in the grip area so you have better control manipulating whatever. Item feels like quality in your hand. Will look to purchase additional Tamiya tools from HobbyLinc in the future. These are my go-to tweezers. They are great for picking up small parts and placing them in tricky or hard to get to places. They are definitely worth the money!